View paid time off benefit usage and balances. View historical time and attendance information. Check worked hours before authorizing a time card. Empower employees with Employee Self Service or Kiosk. 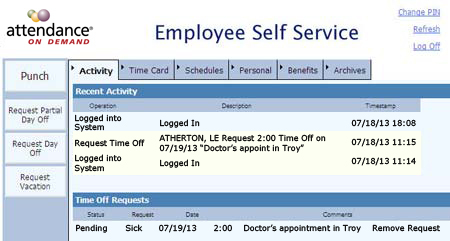 Your employees punch, view their time cards, check paid time off balances, and request time off using a web browser. Access from any Internet browser — at home, at satellite offices, or on the road.